"The spare tire I’ve had around my waist my entire life is all but melted away." My first training goal was just to lose weight. I’d cut down my calorie intake a lot, but after reading Bigger Leaner Stronger I realized my macros were completely idiotic and self-defeating. Fixing my macros (prioritizing healthy fats like Omega 3s and switching to high-quality carb sources) really helped me start shedding the pounds with my training. As a result, I’ve lost 12 pounds, including the stubborn love handles. I’ve seen pretty meaningful strength gains. 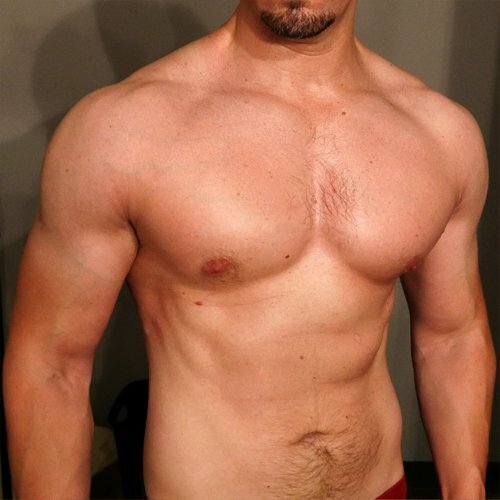 In conventional exercises, like the Guillotine Bench Press, I’ve gone up from 150 lbs. to 225 lbs. And seen my Military Press (which I only started doing back in July) go from 90 lbs. to 135 lbs. I only started Deadlifting a couple of months ago, so my numbers there are still pretty embarrassing– but I’ve been getting some coaching and hitting them hard. So I’m hoping to hit respectable numbers by year end! So I bought the book and read it in a night, then I started reading through most of the articles on Muscle for Life. It was especially encouraging to see Mike’s pics from his earlier years, after he’d spent years training the same kinda dumbass way that I’d been following (sorry, Mike!). I love that Mike demystifies and simplifies everything on both the nutrition and muscle-building front, yet doesn’t dumb anything down. There is so much confusing and contradictory information out there. So many fad diets, so many “revolutionary” muscle-building programs (many of them only accessible if you pay a big fee.) I was just so relieved to find an author I felt I could trust and a training program that worked. He didn’t just give a laundry list of safe foods to eat, nor does he just say, “do these exercises.” He’s not interested in teaching you just the “here’s what to do” and “here’s how to do it,” he wants you to understand, “here’s why you should do it.” That’s true mentorship. I truly can’t believe how accessible he’s been on his blog and via email. I still would’ve endorsed the book, even if he’d been aloof. And if he charged for access, at this point, I’d pay him– his program has gotten me in better shape, and stronger, than I’ve ever been. Mike’s program delivered on the promise of its title. I AM Bigger, Leaner, and Stronger– and I’ve NEVER been able to attain all three before. And it hasn’t required me to spend 2 hours a day in a gym, 6 days a week, nor has it required me to touch cardio work (which I personally hate). But the most important benefit has been entirely internal: Confidence. Not the sort of “contingent confidence” we get from external validation (though that’s nice, too.). Instead, it’s that internal confidence that doesn’t care whether others notice or don’t. The confidence that comes from setting tough goals, disciplining your habits, and pushing yourself to the limits of your strength over and over until you find your goal wasn’t so tough after all, so you have to make set new, tougher ones. I’m doing it because I want to grow stronger and be healthier. I have a beautiful wife, clever, good-hearted children, and I want to be the strong man they all need and deserve, inside and out. Take Progress Pics! It’s hard at first, because if you’re not in very good shape, you’re not likely to want to document it for posterity. I know I didn’t. Yet it’s so helpful when it comes to tracking progress. Subscribe to the Muscle for Life podcast, follow the website, and buy Bigger Leaner Stronger. Guys like Mike are really rare- he’s a natural bodybuilder with an incredible physique, and he wants to help you become not only a bigger, leaner, and stronger person– but a better one, too. I truly can’t believe how actively he interacts with people– thousands of them. I can’t believe he can find the time. Yet find it he does, and that’s the telltale sign that he’s doing this because he truly does care about helping people.